Fresh mangoes in the winter? Yes, they are starting to be available at the Asian markets now. 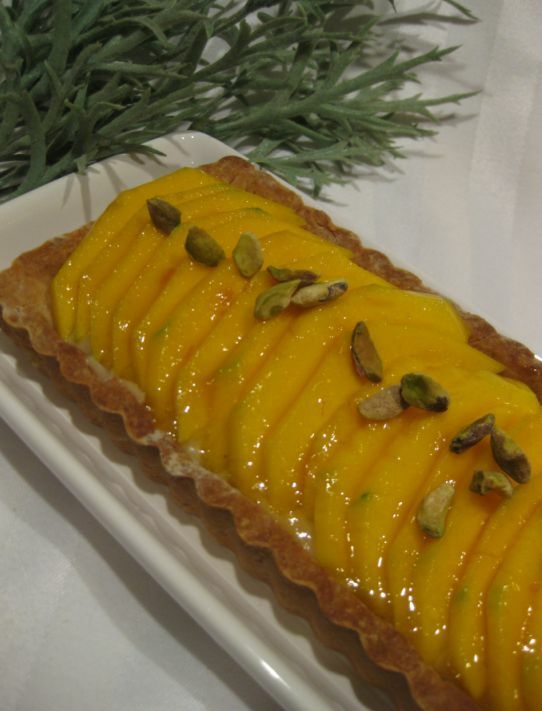 Kent mangoes are very popular with the Asian population for its excellent taste and lack of fiber. I think they are imported from Ecuador in the winter and they are harvested in the United, mostly from Florida, from late June to late September. Basically, I can find Mango for at least 6 months out of the year. 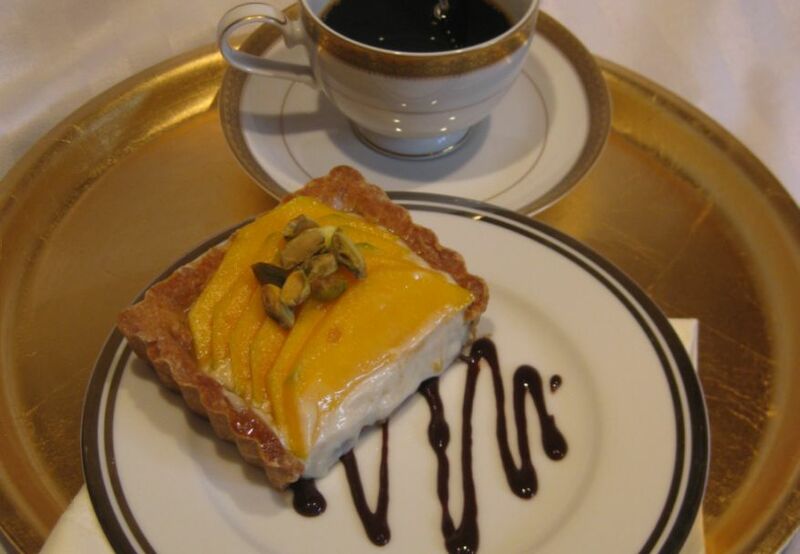 We are going out for dinner with our friends tonight but I am having them over for coffee and desserts afterwards so I decided to make a Mango tart with tres leche (3 type of milk in Spanish) custard. 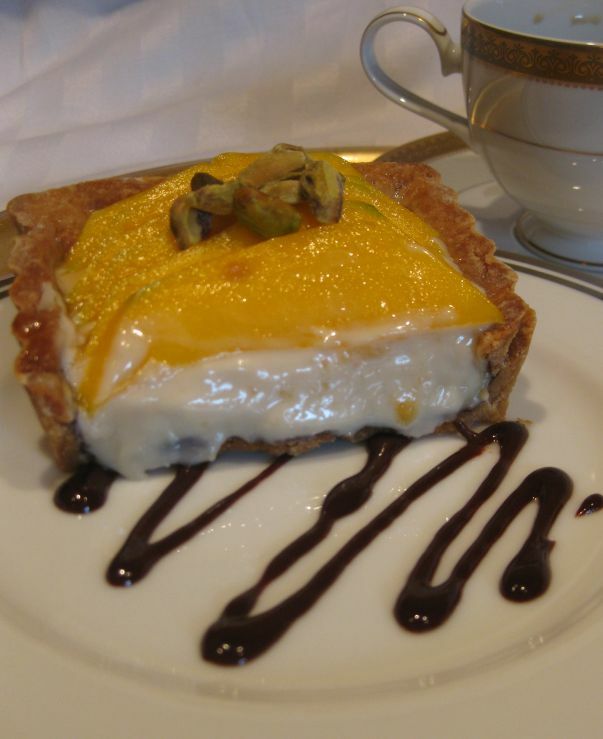 Usually fruits are paired with Crème pâtissière but I wanted to change it a bit and replace it with a tres leche custard. 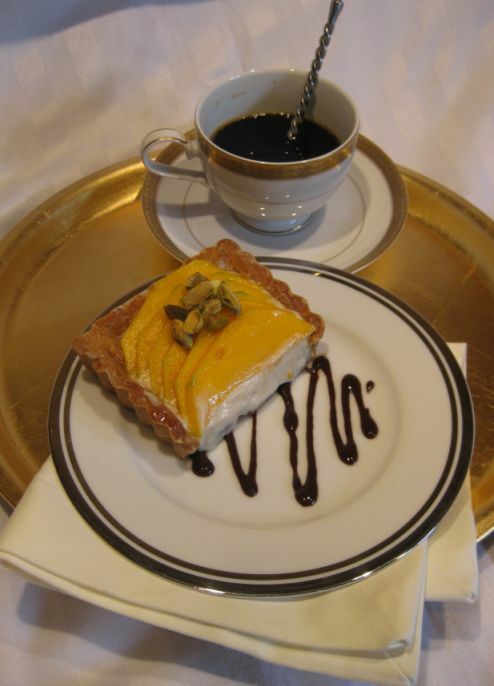 The tres leche custard was very good but it was a bit sweet for me, never the less the flavors was fantastic. 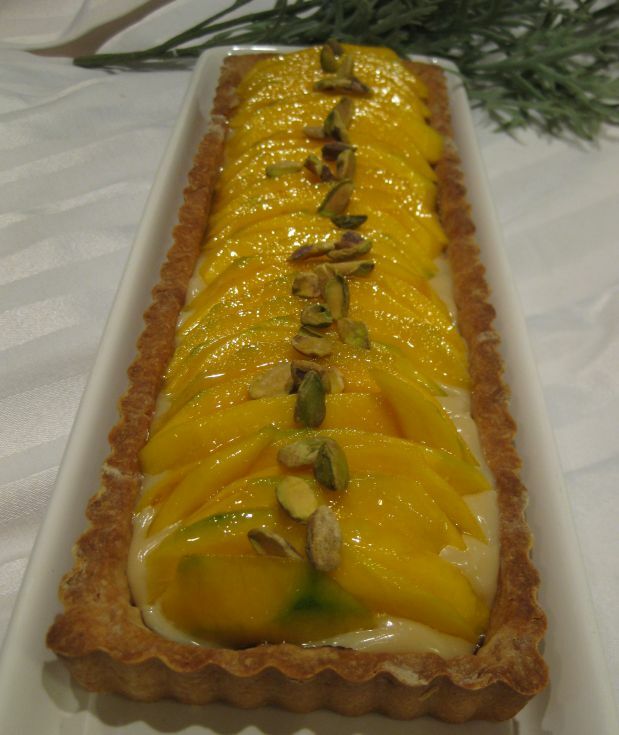 I also served the tart with a bit a warm chocolate and decorated the tart with pistachio nuts. 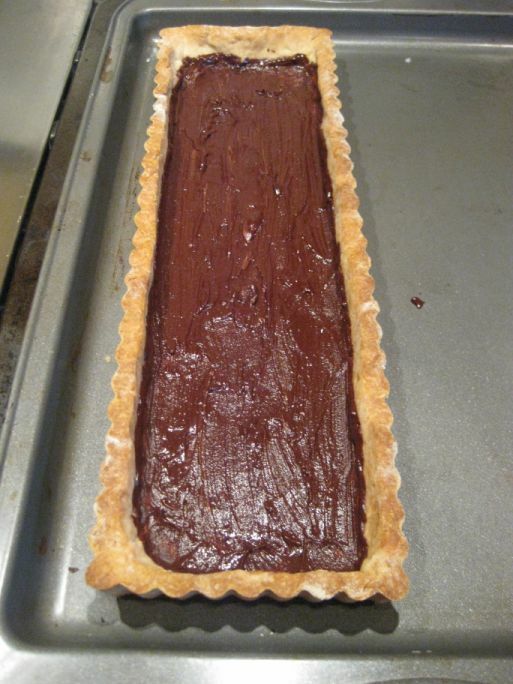 Close look at the tart. 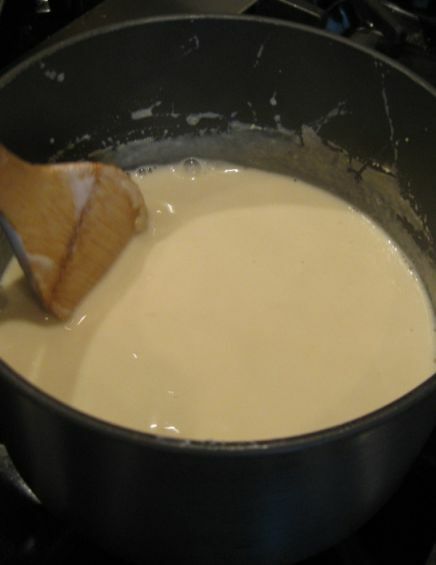 Pour the evaporated milk in a pan and stir constantly until the liquid is beginning to bubble. 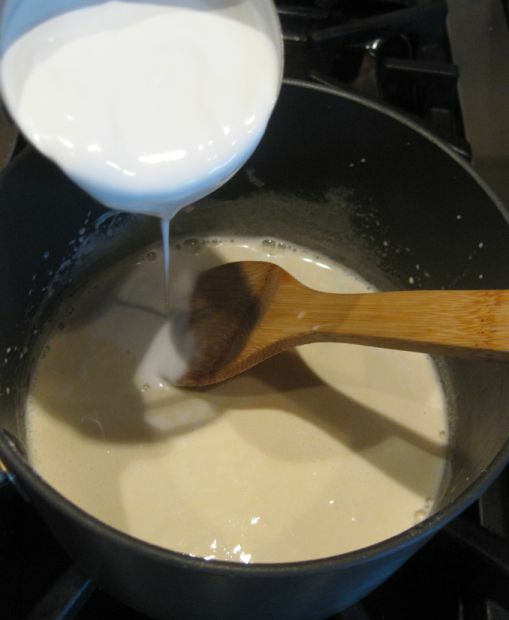 Add the coconut milk and keep stiring until the liquid is beginning to bubble. 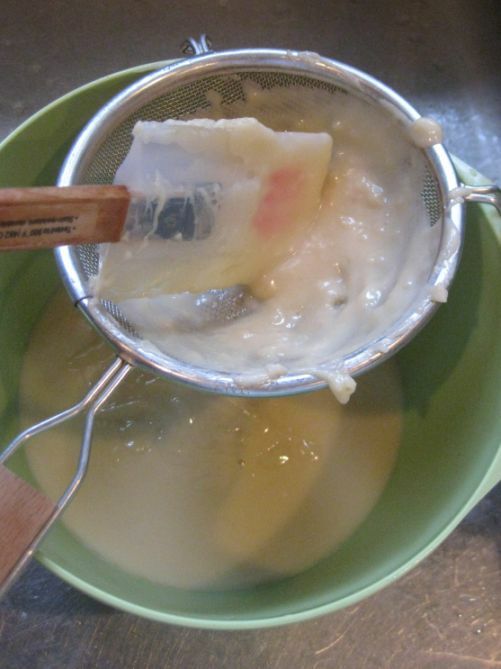 Next add the condensed milk and keep stiring. 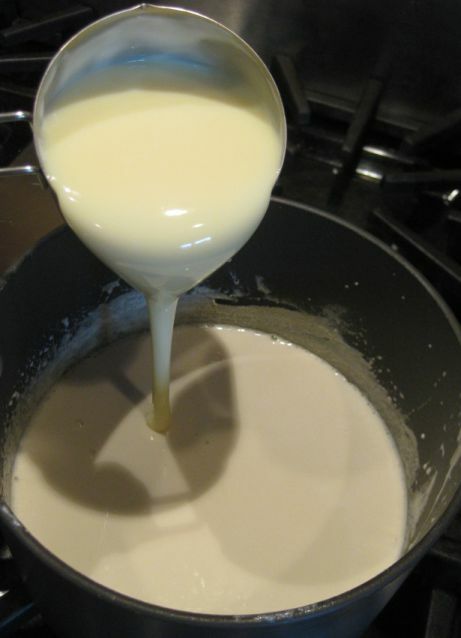 Until the liquid is thick, about 20 minutes. 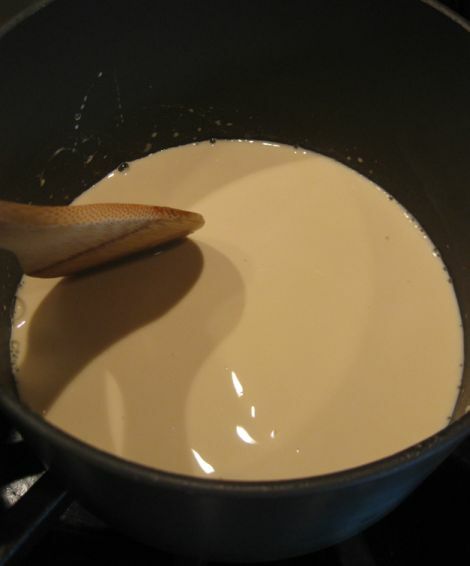 Once it is thick and the color of the cream will turn to light brown. 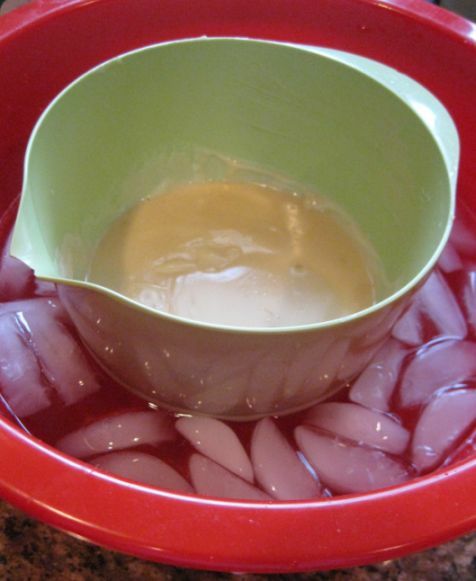 Put the custard into an ice bath for about 20 minutes and then refrigerate it. 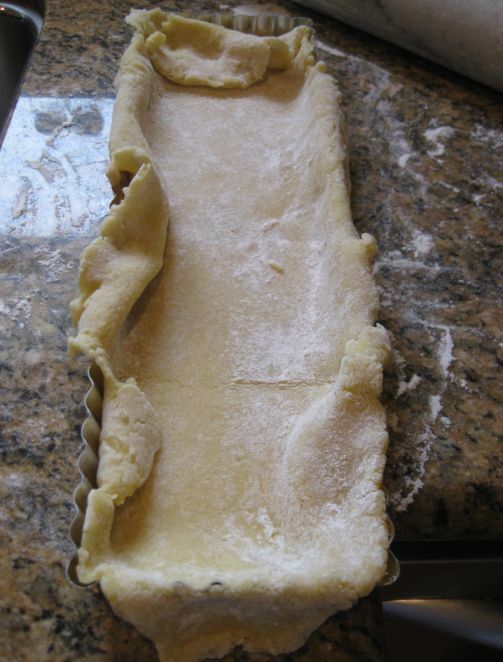 In the mean time roll out the Pâte Sucrée or brisee in a mold and shape it against the mold. 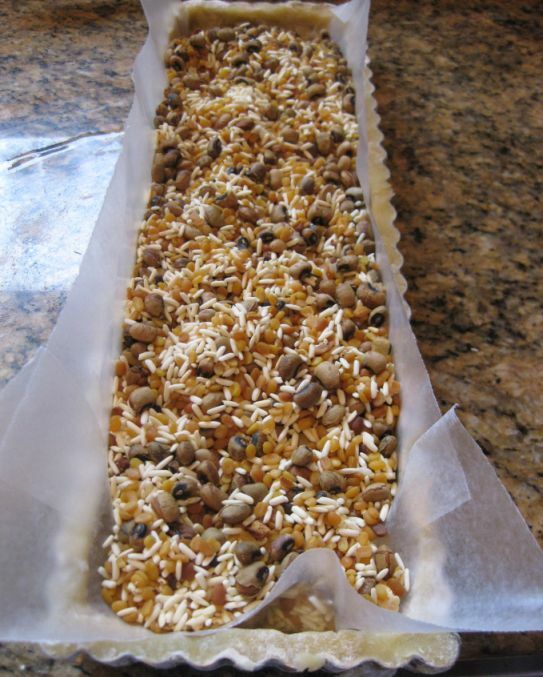 Blind bake the dough until it is golden, about 15 minutes in a 375 degree oven. 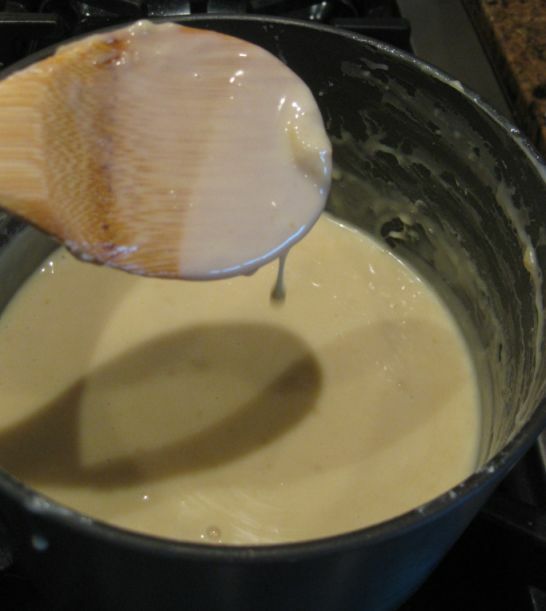 Remove the weight and if it is not brown enough put it back in the oven for a few minutes more. 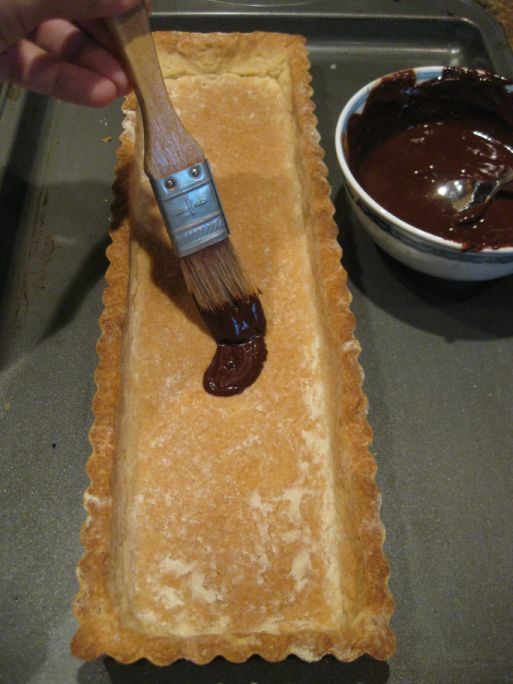 Brush the bottom of the tart with chocolate so that the custard does not soak trough it so that the dough remains crunchy. 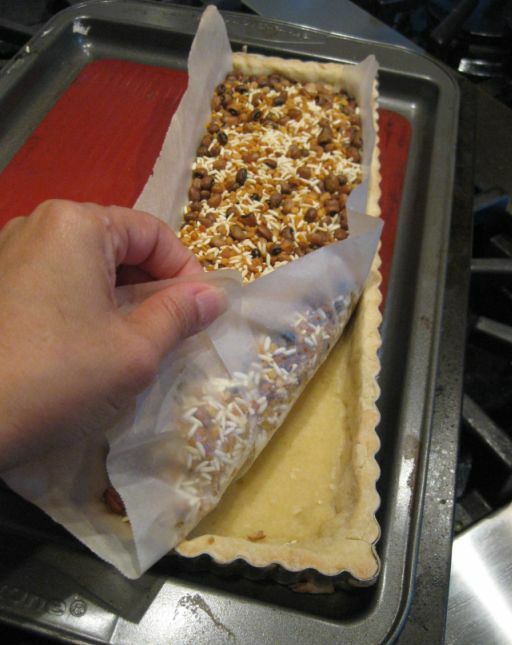 Let the chocolate dry off- about 10 minutes. 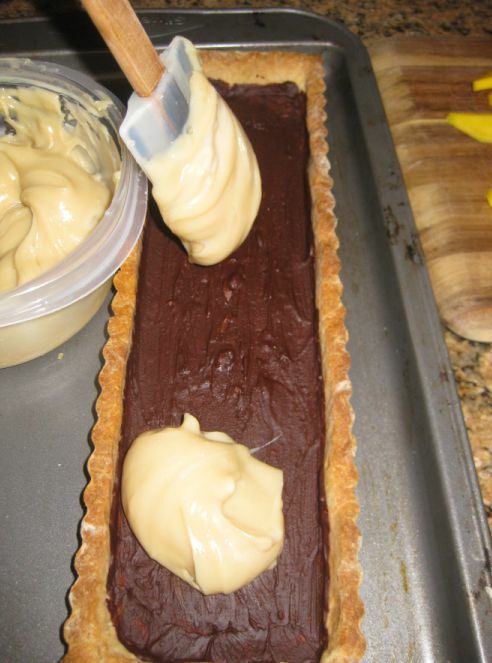 Fill the tart with the refrigerated custard. 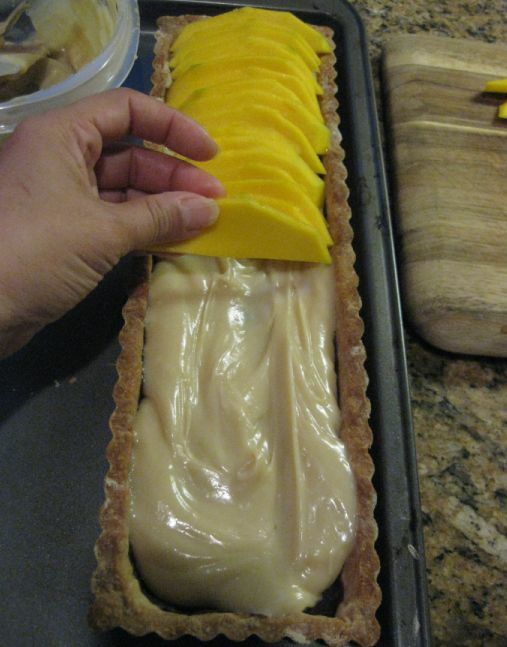 Decorate the tart with the slices of mango. 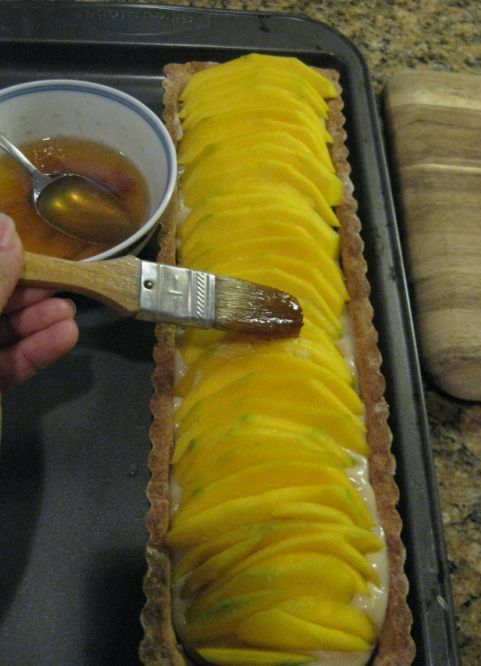 Heat the apricot jam with a bit of rum in the microwave and the brush the top of the tart with it. 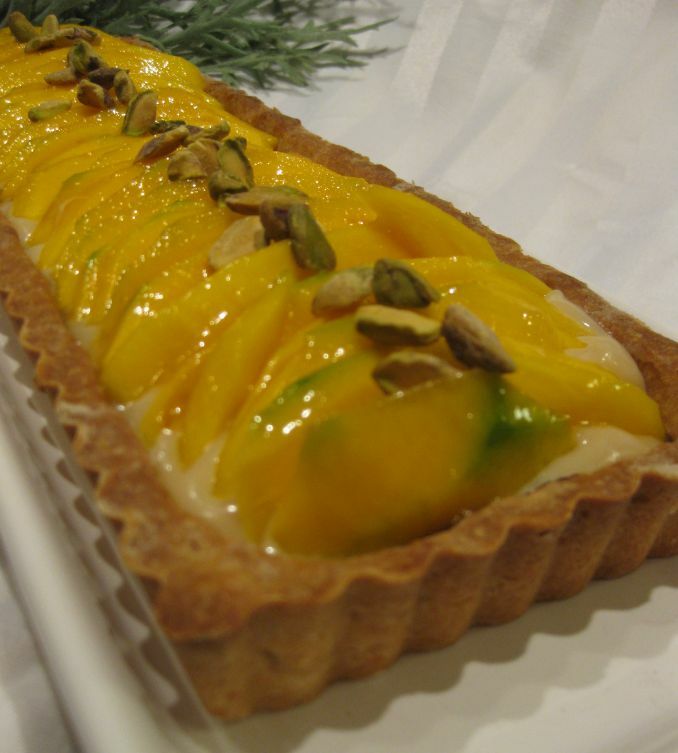 I added some roasted pistachio on top of the tart et voila it is ready to be served.